Football fans will need super snack to watch their favorite teams. Here are several delicious recipes to make. Finely chop 1 small white onion and 1 serrano chili. Mix with 1 cup torn cilantro, 3 diced avocados, the juice of 2 limes and salt to taste. Mix 3 ounces cream cheese, 1/4 cup mayonnaise, 2 teaspoons lime juice, and hot sauce and chopped cilantro to taste, fold in 1/2 pound crab meat. Spread in a baking dish, top with breadcrumbs (preferably panko) and bake at 425 degrees until golden, about 15 minutes. Mix 3 tablespoons melted butter with 1 tablespoon each minced parsley, sage, rosemary and thyme and 2 teaspoons salt. Toss with 3 cups unsalted mixed nuts. Bake at 326 degrees, 25 minutes, stiring once. Form 1 pound ground beef into 12 patties 3/4 inch thick. Sprinkle a skillet with kosher salt; cook the patties over high heat, 4 minutes per side. Melt a slice of cheddar cheese on each patty. Put on mini buns. Warm 2 cups shredded rotisserie chicken with 1/4 cup each sour cream and hot sauce. Serve on 12 mini buns and blue cheese. Recipes courtesy of Food Network. It is well known by the name spekulatius. This crisp cookies came from the neighboring Holland area. The name can be derived for the Latin word “speculator” (overseer), as the function of a bishop was formerly defined. This cookie also is an honor to a bishop, St. Nicholas of Myra that spekulatius is said to have been created. The many variations of spekulatius have one thing in common, plenty of spices. Cinnamon, ginger, cloves, all spice and mace. Traditionally the dough is pressed into molds specially carved to make cookies with. But you do not need cookie press, instead rolled the dough into log size, freeze them, then slice thinly. 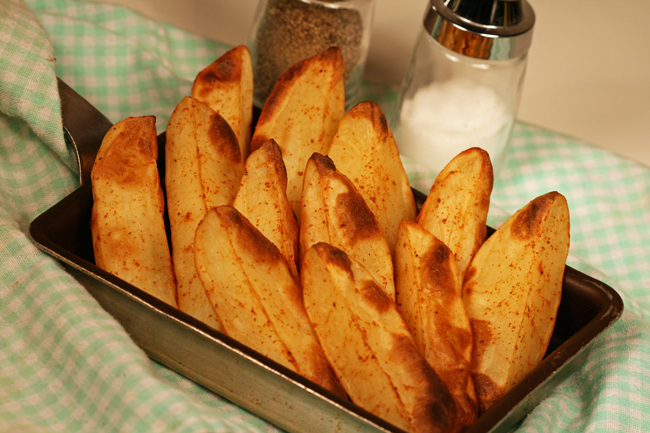 Bake, then you will enjoy crisp spekulatius. During baking your kitchen will have an aroma just like a Christmas store in europe. Stir together baking soda and water until baking is dissolved. Beat together butter, brown sugar, and baking soda mixture with an electric mixer until pale and fluffy. Wisk together flour, salt, and spices, then mix into butter mixture until combined well. Stir in almonds. Form dough into 3 (10 by 3-inch) logs and wrap tightly in plastic wrap. Freeze logs until firm, about 4 hours or overnight. Keeping remaining logs frozen, cut 1 log crosswise into slices slightly less than 1/4 inch thick and arrange slices 1 inch apart on an ungreased baking sheet. Bake in middle of oven until set, 12 to 14 minutes, then transfer to racks to cool. Slice and bake remaining dough in same manner. Active time: 1 1/2 hours. Start to finish: 5 hour. Cookies, cakes, and breads are staple at Christmas season. Scottish shortbread is my favorite. The well-known Scottish shortbread with its melt in mouth taste, date back from 12th century Scotland which is regarded their own speciality. 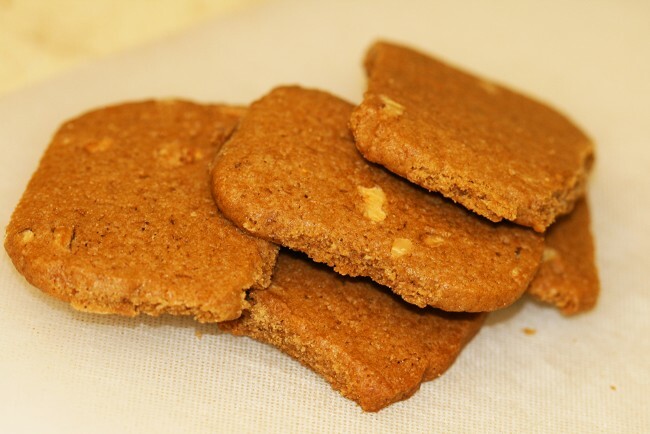 This shortbread cookies was included in a 1594 recipe book and there have been many variations ever since. The only common ingredient is the use of shortening, butter or lard to make the dough soft and crumbly. If you do not like baking, these shortbread can be found in the supermarkets. But, home-baked cookies taste so much better and made with tender loving care. Sift flour, rice flour, cornstarch, and salt into a large bowl. Beat the butter superfine sugar, and confectioners’ sugar in a large bowl with an electric mixer at high-speed until creamy. With mixer at low-speed, gradually beat in the dry ingredients to form a smooth dough. Form the dough into 8 inch log about 2 inches in diameter. Wrap in plastic wrap and refrigerate for 3 minutes. Line a cookie sheet with parchment paper. Use a sharp knife to cut dough int 2/3 inch rounds. Place the rounds on a cookie sheet, spacing 2 inches apart. Refrigerate for 20 minutes. Preheat oven to 325F. Bake for 20 to 25 minutes or until cookies are firm to the touch and lightly browned. Cool on the cookie sheet for 15 minutes, Transfer to cookie racks to cool. You can use cookie mold with this recipe. In a separate bowl, beat butter with electric mixer. Add sugar gradually, followed by flour beating well after each addition. To use cookie cutters, roll out dough on lightly floured surface, to about 1/3-inch thick. Cut out and place on ungreased cookie sheet. Bake for 20 to 25 minutes, until lightly golden. Roast chicken is my all time favorite way to cook a whole bird. 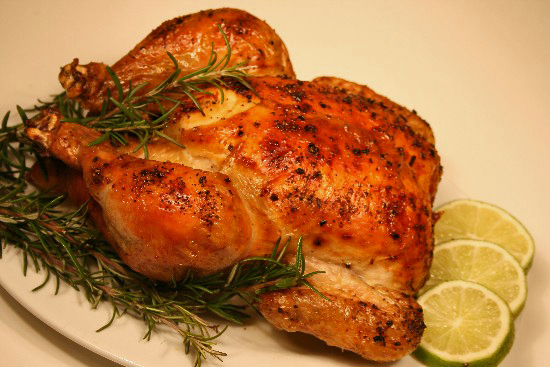 I hope you will try this delicious roast chicken in your kitchen. An easy dish to prepare and your family will enjoy your masterpiece. Included also, information on how to roast a perfect chicken. When the next time you have visiting friends, you will be able to impress them. Enjoy ! Remove the giblets (usually packed in paper bag) from cavity, then rinse the entire chicken under cold running water. Carefully pat dry inside and outside with paper towels. Tuck the wing tips under the chicken to secure tips and prevent them from burning, and to help steady the bird. Bring the legs together and tie with kitchen string (or, in a pinch, heavy-duty thread) to secure. This helps the chicken brown evenly. If using a standard meat thermometer, insert point into thickest part of thigh, next to body (be sure point touches meat, not bone). If using an instant-read thermometer, start testing after 50 minutes of roasting, placing thermometer point in thickest part of thigh. Because an instant-read thermometer is not oven safe, remove it if chicken needs to roast longer. A delightful dish, with sweet roasted onion and allspice. Serve this with tossed green salad and your favorite wine. Preheat oven to 450F. Remove giblets and neck from chicken; refrigerate for use another day. Rinse chicken with cold running water and drain well; pat dry with paper towels. Reserve 2 thyme sprigs; chop enough remaining thyme leaves to equal 1 tablespoon. With finger tips, gently separate skin from meat on chicken breast. Place 1 thyme sprig under skin of each breast half. In cup, mix chopped thyme, salt, pepper and allspice. With breast side up, lift wings up toward neck, then fold wing tips under back of chicken so wings stay in place. With string, tie legs together. In medium roasting pan about (15 1/2″ by 10 1/2″) stir onion wedges with olive oil, chopped thyme, mixture and 1/4 cup water. Push chicken breast side up, on small rack in center of roasting pan. Roast chicken and onion wedges 40 minutes. Add apples to pan; roast about 20 minutes longer. Chicken is done when temperature on meat thermometer reached 175 to 180 F. and juices run clear when thickest part of thigh is pierced with tip of knife. Place chicken on warm platter; let stand 10 minutes to allow juices to set for easier carving. Meanwhile, remove rack from roasting pan. With slotted spoon, transfer onion mixture to platter with chicken. skim and discard fat from drippings in pan. Add applejack to pan and cook 1 minute over medium heat, stirring. Add chicken broth; heat to boiling. Serve pan juice mixture with chicken. Remove skin from chicken before eating if you like. The origin of curry can be traced back many centuries ago in India and the Far East. It is one of the world’s most exciting cuisines, rich in flavors and textures with a seemingly endless variety of dishes to choose from. Curry is a stew or casserole of fish, shellfish, meat, poultry or vegetables, cooked in a spicy sauce. The art of blending herbs and spices which forms the basis of Indian cooking just as ancient are stringent rules of preparing and eating curry. Depending on the climate, the type of produce and religious background the hotter the climate the hotter the curry. The mildest curries are Kashmiri, from the mountains in the north of the Indian sub-continent, whereas the much hotter Vindaloo curries come from the south based on meat, while rice and vegetable curries predominate in the south. The type of meat depends on religion: Hindus never eat beef, and while some eat fish, chicken or lamb, others entirely vegetarian. Moslems will not touch pork but most eat beef. As all in Indian cooking, curry is made fresh daily it is called garam masala or blend of spices. In genuine Indian cooking ready-made curry powder is not being use. The correct way to drink with curry is nothing at all. Indians do not even sip water but wait until after the meal. Western taste buds usually find curry on its own rather spicy, so serve water, cool lager or light ale. To conclude the meal, serve chilled fresh fruit salad or ice cream. This can tame the spiciness of curry. This mixture of spices an essential ingredients of curry dishes, The Indian cook blend spices each day according to the cook’s choice, but the following recipe is suitable for all curries. Ground the whole seeds in a coffee grinder. Blend the ground mixture with the cinnamon and use as required. Any surplus can be stored in an airtight jar and will keep for up to a month. A delicious curry meal can be made from cheaper cuts of meat and this recipe demonstrates how easily it can be prepared. Chuck or blade steak is combined with fresh pieces of celery, apples and carrots, sweetened with brown sugar and raisins, flavored with curry powder, simmered slowly in stock until it is tender. Cut excess fat from the meat and cut into large chunks. Heat oil in a large heavy large skillet. Add the meat and fry over high heat, turning a few times until brown all over. You may have to cook the meat in a few batches. Remove meat from skillet and set aside. Add onions and cook over moderate heat until golden brown, about 5 minutes. Add the apple, celery and carrot and cook until vegetables have softened, about 4 minutes. Mix the brown sugar and the curry powder together. Sprinkle over the vegetables and stir until well combined. Fry mixture gently for 2 to 3 minutes, being careful not to let the curry powder and sugar burn. Return meat to the skillet. Add the raisins and mix well. Pour in the stock and season to taste with salt and pepper. Cover skillet with a lid and simmer gently until the meat is tender , about 1 to 2 hours. 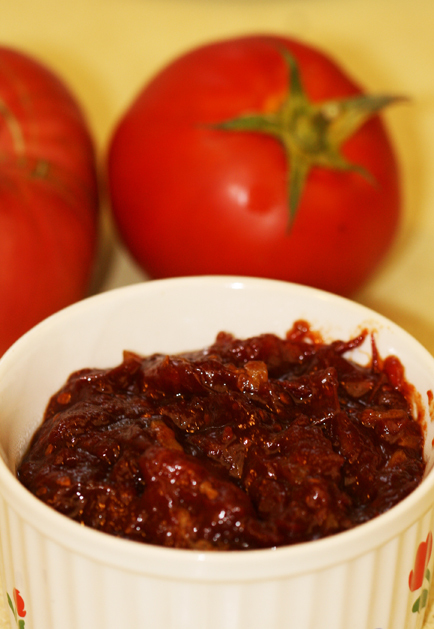 If you have plenty of tomatoes from the garden this is a good way to make a marmalade. Serve on toast, chicken, curry dishes, pork and beef. For the lemon and orange I used organic, if not regular will do just fine. Rinsed, peel, coarsely chopped tomatoes to make 8 cups. With vegetable peeler, carefully remove outer peel from orange and lemon, cut peel into Julienne strips. Hold fruit over bowl to catch juice, cut and discard remaining peel and white membrane from orange and lemon, coarsely chopped fruit. Place tomatoes, lemon, orange peels in a 5 quart pot. Stir remaining ingredients. Bring to a boil, simmer for about 2 hours uncovered until reduced to about 2 pints. Stir occasionally to prevent sticking. Prepare 4 half pint canning jars. Place on lids. Process in water bath for 10 minutes. I love eating French fries but not the fat. Oven-baked fries is so much healthier than those traditional deep-fried. Cut fat by using minimum oil. For sweeter flavor, use sweet potatoes instead of the russet potatoes. Proceed as directed in steps 1, 2 and 3. Add 1/2 teaspoon of paprika when tossing potatoes with spices in Step 4. Bake as directed in Step 5. Place potatoes in a large bowl; add cold water to cover. Let stand for 15 minutes. Preheat oven to 425F. spray a nonstick baking sheet with vegetable cooking spray. Set aside. Drain potatoes in a colander. Spread on a double layer of paper towels. cover with a second layer of paper towels. Press down on the towel to dry the potatoes. Transfer potatoes to a clean large bowl. Sprinkle with oil, pepper, and salt; toss gently to combine. Arrange seasoned potatoes in a single layer on prepared baking sheet. Bake potatoes for 20 minutes. Using a spatula, turn potatoes; sprinkle with garlic. Bake until golden, about 20 minutes, turning baking sheet after 10 minutes for even browning. Serve immediately with ketchup on the side.